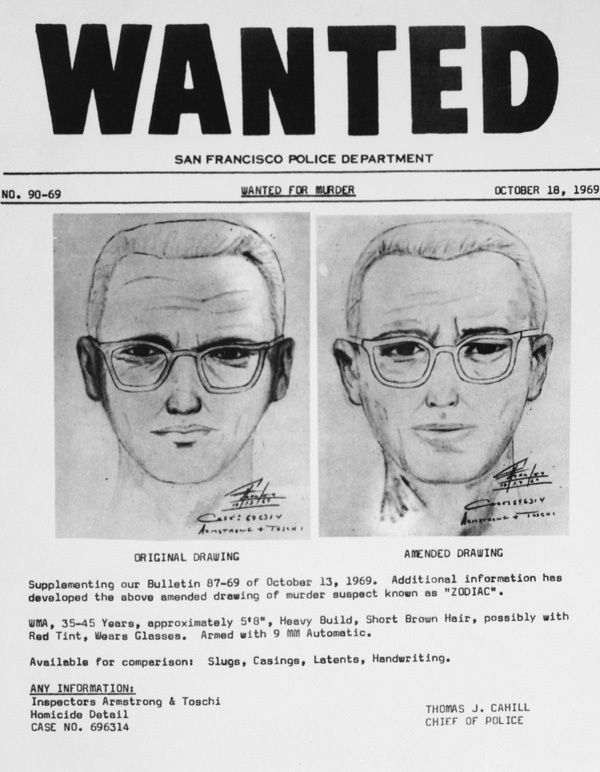 The three teenagers at Presidio Heights described the man they observed at the corner of Washington and Cherry Street on October 11th 1969, and a drawing of the killer in the form of a bulletin was produced on October 13th. Five days later an amended sketch was produced describing the killer as a 'WMA, 35-45 years, approximately 5'8", heavy build, short brown hair, possibly with red tint, wears glasses, Armed with a 9mm automatic'. This revised sketch was supposed to have originated from the three teenagers, despite the fact there was a noticeable change in the age range. Their initial description described the Zodiac Killer as 25-30 years, but now it had risen markedly to 35-45 years. That is a median rise of nearly 13 years, and despite viewing the taxicab from 50-60 feet away, the other changes could be described as subtle. Furthermore the police report countersigned by Armond Pelissetti and Frank Peda at 6.29 am on October 12th 1969, described a #2 SUSPECT on the second page, as a ​'WMA, in his early forties, 5'8", heavy build, reddish-blond, crew cut hair. wearing eyeglasses, dark brown trousers, dark (navy blue or black) "Parka" jacket, dark shoes. Suspect should have many blood stains on his person and clothing, suspect may also be in possession of the keys to the Yellow Cab, possibly has wallet belonging to the victim. Last seen walking north on Cherry Street, from Washington Street'. Again, who supplied this information, after all the age description of a suspect in his early 40's seems far removed from the 25-30 yrs initially given by the three teenagers. Many people have suggested this revised sketch and #2 SUSPECT in the police report may have originated from Donald Fouke's sighting on Jackson Street. There is a problem with this notion however. Donald Fouke never issued his memorandum until November 12th 1969, and gave an age range of 35-45, 5'10" in height and described the suspect's hair as 'light colored'. This in essence sounds similar to the #2 SUSPECT in the police report, as well as the amended police sketch, apart from 'short brown hair'. The problem is that Donald Fouke was never credited regarding the amended sketch. Donald Fouke also stated in the 2007 Zodiac documentary "One month later when the composite drawing came out at Richmond Station and was posted on the wall he looked similar to the man I had seen on October 11th, I then wrote a scratch to my lieutenant to forward to homicide division, so they would have the additional information and appearance of the suspect." This again does not sound like a statement of somebody who had already contributed to the amended sketch weeks earlier. The greatest stumbling block regarding Donald Fouke providing the #2 SUSPECT in the police report is the final line, describing a suspect 'Last seen walking north on Cherry Street, from Washington Street.' Donald Fouke last saw the suspect walking east on Jackson Street, in the vicinity of Maple Street, which he attested to in his memorandum on November 12th 1969. But the police report not only doesn't mention Donald Fouke anywhere, it certainly doesn't say "Suspect 'Last seen walking north on Maple Street, from Jackson.' Therefore the only contributors to the #2 SUSPECT description most likely had to originate from a vantage point allowing them to view the suspect heading up Cherry Street. 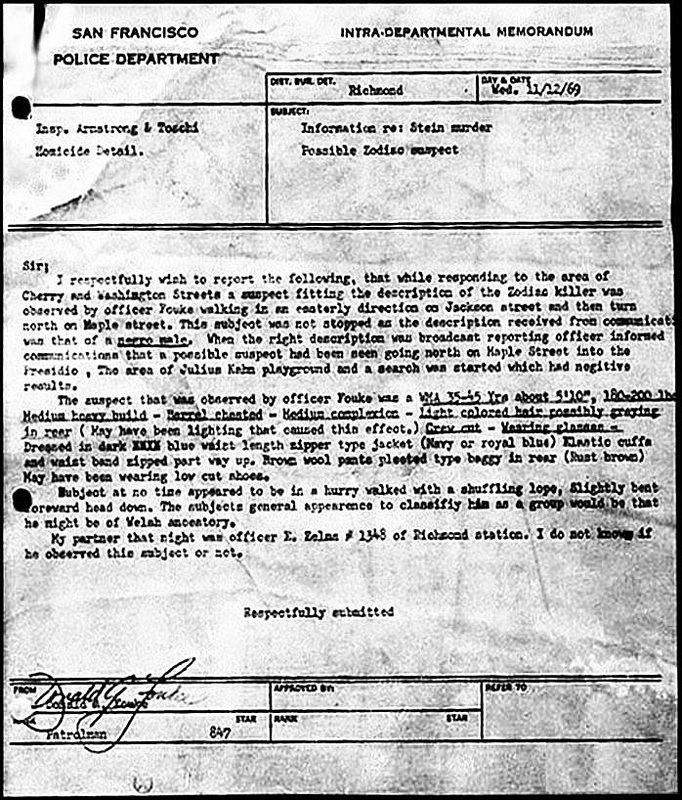 One could possibly accept the amended sketch originating from the three teenagers, but the #2 SUSPECT was apparently typed up and countersigned by Armond Pelissetti by 6.29 am on October 12th 1969, just 8 1/2 hours after the murder of Paul Stine, raising the question, how could the three teenagers describe the suspect as '25-30 years of age' and a man in his 'early forties' inside of 9 hours, unless this document was subsequently added to. They would also, although less significant, have to have altered the suspect's hair color from 'reddish-brown' to 'reddish-blond' within the same timeframe. We have one major problem mind. If the contributor to the #2 SUSPECT was not Donald Fouke or the three teenagers, who was it. A newspaper article was published by the San Francisco Chronicle on October 12th 1969 regarding a man seen running into Julius Khan playground, describing the man in similar vein to the police report, aged about 40. This again however was beyond Cherry Street and the police report did not state that the suspect was 'Last seen running from Spruce Street into Julius Khan playground'. It has also been suggested that Armond Pelissetti 'incorporated' Donald Fouke's description into the #2 SUSPECT, but if this were the case then Donald Fouke should have been mentioned in the police report, and the final sighting of the Zodiac listed as 'walking north on Maple', plus Armond Pelissetti by all accounts didn't accept Donald Fouke had seen Zodiac. This is what he said in the 2007 Zodiac documentary "I believe that Fouke would have been honest, but that scratch and what he told me do not coincide. It seemed Officer Fouke in that amount of time felt that he had stopped the Zodiac. Well, it's very hard to say whether he did or not, it would be a point of conjecture at this point and he seemed quite upset. Fouke was also very clear as to what the person was wearing, well it just so happens that area is extremely well lit and I cannot imagine his not seeing the shine of blood on the clothing if it had been Zodiac. I feel bad for him if he believes that was Zodiac. I don't think it was." Not the words of an officer who is going to incorporate details of a suspect off his own back, without referencing the source (Donald Fouke) and then countersigning the police report for which he is responsible. The police report is also separated into six sections #1, #2, #3, #4, #5 and #6. Section 1 deals with the teenagers description of the events in and around the taxicab, section 2 is the description of the suspect, section 3 deals with the property of Paul Stine and the taxicab, but sections #4, #5 and #6 are effectively left blank, with N/A or not applicable written after them. The teenagers had already given their description of the suspect to the police dispatcher over the telephone and were to prepare a comprehensive description of the suspect with a police sketch artist. The question is, were #4, #5 and #6 deemed not applicable by Pelissetti, as a full and proper description was already being designed, in the form of a wanted poster and Pelissetti did not want to contradict it in the police report. The #4, #5, and #6 may very well have represented the three teenagers descriptions of the suspect, but since they were working on it together, it was considered not applicable. Let us consider the #2 SUSPECT to be from the three teenagers. They give a description of a man in his early forties with reddish-blond hair, countersigned by Pelissetti at 6.29 am on October 12th 1969. By October 13th 1969 the teenagers first sketch is released, but has changed to a man around 25-30 yrs with reddish-brown hair, then a few days later they supposedly have a change of heart and an amended sketch is released describing a man aged 35-45, short brown hair with a red tint. Bearing in mind the #2 SUSPECT, is it conceivable #4, #5 and #6, could have been #4 SUSPECT, #5 SUSPECT and #6 SUSPECT, but in view of the composite sketch they were simply marked not applicable. The answer may simply come down to indecisive teenagers who disagreed among themselves, fluctuating back and forth, until a compromise of 35-45 years was attained in the revised sketch. Or ​was it a fourth sighting that ultimately gave us the #2 SUSPECT description and an additional eyewitness who may possibly have had a hand in the amended police sketch. The only viable eyewitness we know of, is the 8 year old witness detailed in the FBI files as a witness in the murder of the cab driver, who by inference must have lived within a comparatively short distance from the intersection of Washington and Cherry, to be able to 'see the suspect walking north on Cherry Street.' This eyewitness and their family, may have reported the sighting to police near to the scene and requested that their identity be kept discreet, due to the sensitive nature of their statement, hence only the reference to a #2 SUSPECT without the source. Is it also fair to say, that if this 8 year old was a 'witness in the murder of the cab driver', then a description should have been taken from this child, as it was from the three teenagers, and subsequently taken into account when releasing any descriptions of the killer. The FBI file itself is suggestive that this sighting was regarded as important. If you notice Alex, the initial police sketch makes lots of errors or assumptions, notably that the suspect sits in the front seat, orders the driver on at gunpoint into or near the park, for which there is no evidence for or any eyewitnesses to testify to this fact, especially considering Paul Stine was dead and highly unlikely he radioed in under gunpoint, otherwise Leroy Sweet would have mentioned this. This was clearly someone's mind just running away with itself and to be honest a bit unprofessional on behalf of the San Francisco Police Department to run this nonsense. However the sketch also states "Tells driver destination is Washington and Laurel or area near park or Presidio". Now you can let your mind run on the way events went down, but considering the taxicab was found at Washington and Cherry, the mentioning of a destination of Washington and Laurel is surely not something you pluck out of thin air, unless it has a grain of substance. It is assumed the trip sheet had the destination of Washington and Maple, as depicted in the 2007 Zodiac film. However Washington and Laurel is three blocks further east and four blocks from Washington and Cherry. That is quite a big discrepancy. In fact it is much closer to 3218 Jackson Street. I am dumbfounded as to how the creator of this sketch arrived at Washington and Laurel. There has to be a viable reason, you surely don't just pluck a random street name from nowhere. Well Rich, let's say Zodiac did Get in and whether from Union Square all the way to Cherry, or only from Maple to Cherry, forced Paul to drive at Gunpoint. If this happened, at all for any length of the drive, then for me it's a strong argument against Z riding up front. Why? Zodiac would not have a vantage point from which the male victim could not fight back, make a grab for the gun etc. We know Zodiac if and when He could eliminated the Male victim as quick and soon as possible with a single shot to the head. David Faraday was to suffer this fate, so would Michael Mageau had He not seen the gun and thrown His head back and as Z Himself acknowledged 'Thus, spoiling My Aim." Refused to tie Bryan Himself and ordered Cecelia to do it, and when Bryan hinted He thought He may be able to disarm their hooded intruder, Bryan stated "Well, He stepped back a few steps after that and I never had the chance again." So, after all this very clear and obvious showing of fear of Male's ability to resist if given the chance, there's just simply no way in hell for me He's going to allow Himself to be within arms reach of Stine in Stine's View. He's behind Him in order to ambush an unsuspecting and therefore defenseless driver. Rich, I came across an individual today who is, well. . I'll tell you in an Email now mate. Not just looking to tell You something which may be very exciting & could help develop a much clearer picture of the Oct 11,69 Incident uI just am not sure I should reach out too this one potentially significant Individual & your advise, much wanted. .